Bespoke Hand Made Suits are the ultimate choice for hand crafted suits. 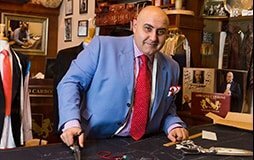 Adriano Carbone is a Master Tailor with over 40 years of experience in the industry. 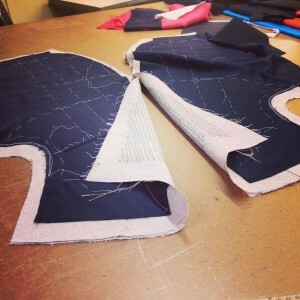 Adriano is an expert in creating custom made suits garments that you’ll be proud to wear. Each Garment is fully canvassed and hand-stitched from start to finish. If you’re a suit connoisseur and pride yourself on looking your best, our bespoke suits are the best option for you. Bespoke Suits take more than 100 hours to make which shows you the level of dedication and care we take to create the best bespoke suits. Firstly, Adriano takes measurements of your body and a few photos to assist in cutting out the fabric. You will get your own personal handmade pattern which is kept on file for future purchases. Next, the garment is 30% constructed, adjustments are made and two weeks later there’s a second fitting. Once the adjustments are made after the second fitting of your suit, we have a third fitting to make sure all is balanced in the garment. Adriano completes the final touches including making button holes and pressing the garment, ready to be presented to you at your third and final fitting. Bespoke suits are created to suit your body. As with all of Adriano’s suits, you can choose the style and fabric of your suit with the customisations below. As with all other style choices with the bespoke suits, Adriano will help you choose the best fabrics to suit you. We use the below fabric. Our bespoke coats are made with upmost care and skill. Coats are come in either single or double breasted styles. Vents in the back of your coat can create space for movement and adjust the presentation of your body shape. Depending on your body shape and your style, you can choose between having pleats or no pleats on your trousers. Flat fronts are more slimming while pleated trousers offer more range of motion. There are a range of pocket styles you can choose for your coat. With our bespoke suits, you can choose between four trouser pocket styles as listed below. Feel free to call Adriano with any questions about our bespoke suits hand crafted in Melbourne’s CBD.